Listening to metal with a great deal of ethnic folk flavor to me is like philately. One little stamp can tell a story about a country of its origin, or send me on a chase to learn about such story. If the band truly cares about their country’s history, it always shows in their art. Positive side effects can be numerous, from lyrics not needing an external source of inspiration, to the album scoring high on the memorability scale due to its unusual flavor. From the recent trips down this lane I can still recommend Eastern Prussia’s Tvangeste, and even more so Faroese Tyr (glad to see that Napalm Records suits got my memo as well). 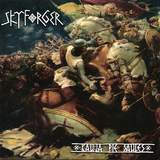 Skyforger comes from Latvia, a Baltic republic, for those geographically challenged. Kauja Pie Saules (The Battle of Saule) is not their new album, but rather a re-issue of 1998 debut, originally released on Dutch Mascot Records, and since lost for posterity if not for Paragon carefully stepping in. I would not have brought the folk metal angle if Skyforger subject matter did not grant it. Their songs are stories about the series of battles Middle Ages Latvians, the people composed of four separate tribes, had to endure while protecting their land from the Knights of the Order of the Sword. If any one read Crusaders by a Polish writer Henrik Senkevich, he/she knows that 1200 – 1400 couple of centuries was a tough time for the pagan tribes of the Baltic. German knights were bringing Christianity with a sword in one hand and a flame in the other. Under the guise of converting pagans Teutonic aggressors were conducting an outright land grab. Skyforger music reflects that time, showcasing Latvian sensitivity, but also steadfast toughness in trying to put away the inevitable. The forces on two sides of this fight were too uneven for the pagans to survive, with only their spirit and melodies left to posterity and now captured by Skyforger. The band has several songs on Kauja Pie Saules that are pure traditional Baltic folk music, campfire clean chorus singing, horses neighing in the distance and owls howling in the night. Sung in Latvian, driven by traditional instruments Zviegtin’ Zviedza Kara Zirgi (Neighed the Battlehorses) and Kam Pusat Kara Taures (Why the Horns of War Are Blown) set the atmosphere well. Skyforger, however, is not just folk music. These Latvian dudes have certainly paid attention to Bathory’s Viking era and must have enjoyed Enslaved Frost as well. Kauja Pie Saules draws significantly on that style of Norwegian black metal and makes no apologies about it. Even Peter’s vocals are extremely reminiscent of Grutle Kjellson’s croaking. A substantial portion of the album alternates between thundering guitar crunch and determined buzzsaw grit, all supported by bass heavy production (something a little lost on the early 90s Norwegians) and bombastic drumming. The title track gathers in intensity throughout the song, Viestarda Cina Pie Mezotnes (Viestards Fight at Mezotne) is also edgy with its tremolo, whereas fast guitar picking in Kauja Garozas Sila (Battle at Garoza Forest) sounds heroic, after progressing through a doomy grinding march. Such gritty courageous melodies have been lately popularized by Amon Amarth, but I am sure with Kauja Pie Saules seeing the light of the world in 1998, the two bands were simply on parallel paths. Svetais Ugunskrusts (The Sacred Firecross) is definitely something an Amon Amarth early material fan would enjoy. Keljs Kala Debesis (Forger Forged Up in the Sky) throws in an air raid siren guitar lead, and quite nasty Bathory style thrash. The best moments of Skyforger come when they differentiate themselves from the Norwegian sound by dipping into their own inspirational well, by throwing a captivating epic clean-vocals backed chorus on Kursi (Kurshi), by having the flute (kokles in Latvian?) to take the lead on Sencu Ozols (The Ancient Oak) and Svetais Ugunskrusts (The Sacred Firecross), or by introducing the latter with a harp. Stomping rituals of Sencu Ozols (The Ancient Oak) would have been simply incomplete without the flute and mouth-harp. Moments like these, Kursi opening clean chorus with the tired but proud men sailing to nevermore, bagpipes on Keljs Kala Debesis is what brings their own profile and authenticity to Skyforger. It also shows the hardship, the struggle of uneven odds and the vulnerability of the ancient Latvians. This album one more time debunks the myth of why designating such metal style as Viking Black Metal is stupid, as there is nothing Norse or Viking in nature about Skyforger. Pagan is a much better attribute. As a kid I traveled a lot with my dad, kayaking down some lakes and rivers in Soviet Lithuania and Latvia. This is a beautiful country with big-hearted people, and this album, complete with battle art by native painters, helps to understand where they are coming from.